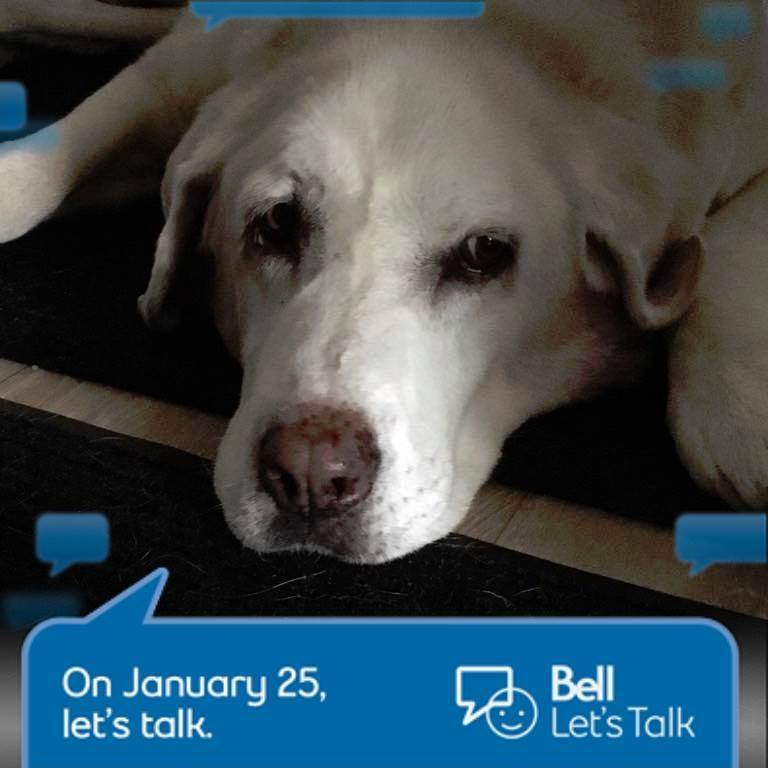 Yesterday, was Bell’s “Let’s Talk” Day. Many people tend to think of psychological illnesses as a uniquely human trait. But that assumption would be wrong! There is growing evidence that many animals can suffer from mental health disorders similar to those seen in humans. Anxiety, Depression, Obsessive behaviours, Post Traumatic Stress Disorder, and this list goes on. These conditions that affect animals could help us understand how and why humans become mentally ill, and why these debilitating disorders ever evolved at all. Some animals are known to self harm, by pulling out there own feathers or fur. Service animals that have been in combat situations suffer from PTSD returning from their tours of duty with anxiety and panic attacks. There was a case of chimpanzee whose mother passed away, her child refused to eat and became withdrawn, eventually slipping away. Whether they are pets, or animals kept in poorly managed zoos or circuses, animals can become excessively sad, anxious, or even traumatized. The next question that should be asked is, do these animals suffer because they are influenced or affected by the impact of their human interactions? There has been many studies of animals in the wild, it has been found that some species like lions or wolves, that do not behave within the norms and do not act characteristically like the rest of the pride or pack, end up dying. Is it because these animals with mental disorders can’t make it in the wild because they are not necessarily getting the care or support that mentally ill humans do, therefore they can’t perform critical tasks to ensure their survival, and due to this lack of support they can not thrive. I think the point that can be made, is that we are all part of this earth, we are all affected by the experiences that his planet undergoes, that each of us are a sum of it’s parts. I wonder as we advance with technology and mechanization if our planet and it’s species are struggling to keep up with the affects of progress and how it impacts Earth? However, mental illness is not a new development, asylums and sanitariums have been around for centuries. I think the difference is that humanity is developing an openness to discussing our diverse natures. We are not all cut from the same cloth, we all suffer in some way, shape or form, the difference now is that people seem more open to discussing and accepting mental illness and doing away with the stigma attached it being out of the ordinary. We are coming to realize that our pets and animals in general, like their human counter parts, have mental struggles! They suffer from abandonment, loneliness, anxiety, hyper activity, a lack of connectedness, the fact is, we all feel pain! What we humans need to understand is that we are all different, we are all messed up and imperfect (something I think our animals already understand, this is why they love us unconditionally). We need to find ways to express acceptance and embrace diversity! If we wish to continue to evolve, we need to be open to understanding that we all perceive this world differently and need to be respected, loved and cared for despite those frailties we may cope with from day to day.